Thank you for all your lovely compliments on my latest projects. Like about 100% of bloggers, The Sewing Lawyer loves comments, so keep them coming! DIGS slyly asked me how my dress is coming along. Well, as you can probably guess, my dress is still in flat folds on my sewing table! However, I've been doing some mental sewing which is all part of the project prep, don't you agree? In this case, part of the mental prep is coming to terms with the fact that if the evidence is confronted, by the time I can finish the dress, the just-finished bouclé jacket will be far too heavy to actually wear with it. 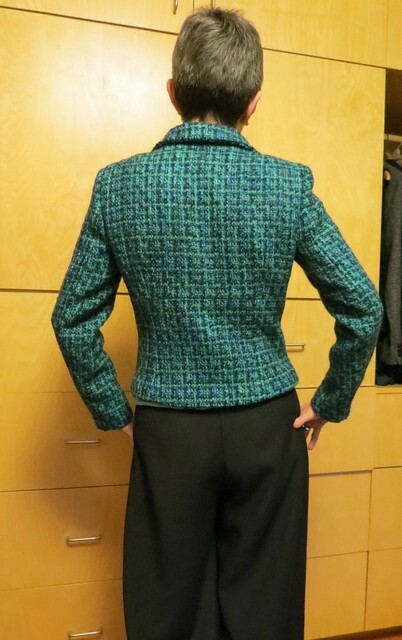 So I dug into stash to see if I had a lighter-weight jackety fabric to go with the turquoise wool crepe, and I do. Surprise! It's a nubbly, multicolour raw silk tweed. Not only that, the china silk fabric I had earmarked for lining the bodice of the dress looks kind of nice with the tweed. So the dress could be next in the sewing line-up. I'll let you know. But in the meantime I started another pair of socks, toe up this time. One down, one to go. Ahem. I'll take another sewing question. In response to the post about ripping out sleeves and matching plaid, Lena Merrin asked: "Just curious, your sleeve still has ease even though the fabric stripes are matching, right?" I suspect you asked because of Kathleen Fasanella's famous post, Sleeve Cap Ease is Bogus. It's a very thought provoking article but you can match the plaid in a sleeve cap to the jacket body, front and back, even if the sleeve cap seam line is longer than the seam line of the armscye (i.e. even if there is some ease in the sleeve cap). My jacket is the living proof, but here's my take on the geometry. This is a quick and dirty draft from PMB with some pretend plaid drawn on top. The program drafted a total of 2cm of ease in the front of the sleeve cap. Because the armscye seam is more vertical than the sleeve cap seams, the distance between the plaid lines where they hit the seam line on the sleeve cap is greater than the distance between the same lines where they hit the seam line of the armscye. When you ease in that extra distance the plaid lines can be made to match (more or less). 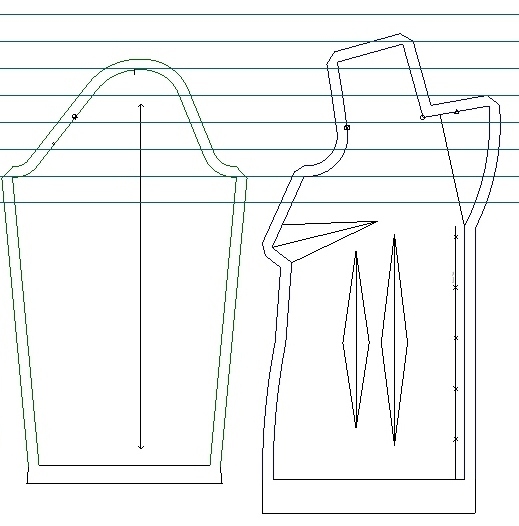 After my pattern modifications (reducing dart take-up in back, lengthening at hem in back, adding width through the midriff, inserting light shoulder pads and sleeve heads) I am left with this quite lovely shape. It's fitted without being tight, and the collar sits nicely away from my neck. I'm wearing this with my black pants; I have some dark navy pantweight wool in stash. It would look better with the blue-green wool. I just have to find it. And make the pants. I wonder if I can do it before July? Now that I've got this lovely new rather thick wool jacket, temperatures in the 20s (C) are forecast. It figures. Yes indeed! The Vogue Leaf Yoke Top is done, and I love it! 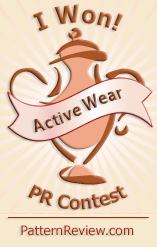 And I'm going to enjoy wearing it. My next task is to finish the jacket which I think it will look good with, and figure out how to slot it into my wardrobe. But for the moment, let me share with you why I'm pleased with these edges. The neckline and arm openings are finished with i-cord. It's devilishly clever (although I followed Vogue's instructions which are slightly different from those illustrated in the video). I changed the hem, thanks to the very generously shared ideas of others who had made this and posted about it on Ravelry. Vogue wanted a turned back hem which I thought would be bulky. Trust the math. The pattern called for a gauge of 19 stitches and 26 rows in a 10cm square; my yarn swatch showed 24 stitches and 30 rows in the same space. I realized that if I knit according to the size large, the finished garment would be the right circumference. If it's not right, rip it back and re-knit. It doesn't actually take very long, and the not-quite-right feature would really bug me. I think I knit the front just below the lace yoke 3 times before I was satisfied. I knit the lace and i-cord hem twice. The Sewing Lawyer is a tad on the perfectionist side. She has a seam ripper. And she's not afraid to use it. It's a good thing this wool is very thick and forgiving! One can try on a WIP if it's being knitted from the top down. All I had to do was transfer about 25% of the stitches to a separate circular needle so I could put it over my head. This will fit looser than the Vogue version but I think it will be just fine. 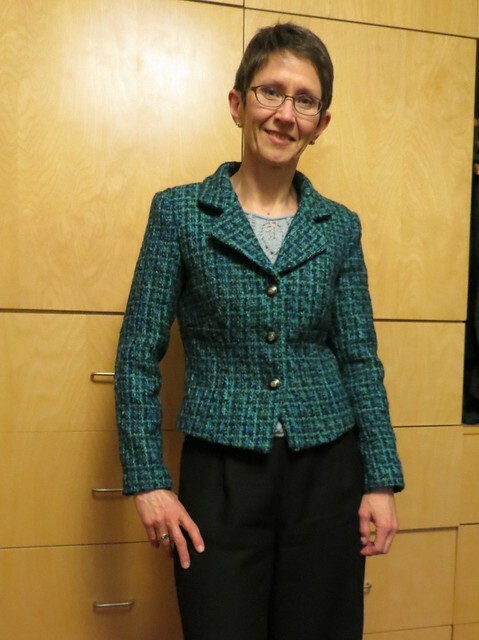 It has been so long since The Sewing Lawyer made a jacket, she thought she had forgotten. But she hadn't. A forgiving, cushy wool fabric helps. Remembering to cut it out single layer to (more or less) match the plaid is also a good idea. Although this guarantees that the seams practically disappear. 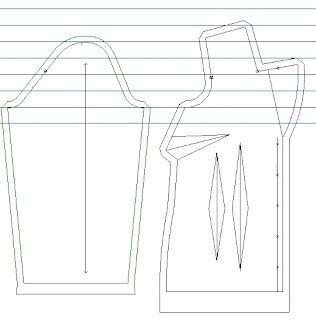 I adapted the pattern to add extra fabric around the edges of the upper collar and lapel facings, since the outer layer of this thick fabric has to travel farther than the under-layer. In this photo, I have pinned the upper collar/facing layer to the under collar/jacket layer, matching the neckline seams exactly. When the upper collar is folded over, the raw edges are quite even at the back. I'm going to have to fiddle with the under collar at the leading edge. As you can see here, it seems longer than the upper collar. I think I'll trim the curved edge to exactly match the upper collar before sewing the two layers together. This will avoid any risk of the collar flipping up after it's constructed.